COOPERTOWN, Fla. — The swamp in the Everglades is like nothing I had ever seen before: It is both beautiful and eerie. 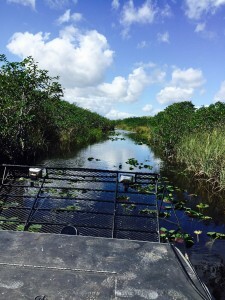 It’s neither sea nor land; when gliding along in an airboat you feel like you’re floating. Each twist and turn the boat takes brings you to a different part of the swamp that hadn’t seemed possible to access. There are beautiful mangrove tunnels and sea grass as far as you can see and has the look of paradise but also had a definite unnerving undercurrent … almost as if it could also be something out of Dante. Even at its very slowest speed, the airboat emits both a low rumble and high-pitched whine. Gone is low peaceful hum of the native insects and the need for bug spray; in the wind of the airboat we are saved from the unwanted attention of the mosquitoes and gnats that just moments before caused us to buy a new can of bug spray. Everglades scenery from an airboat (Photo by Renee Vesselinovitch). My parents, Joan and Alex, were in town for the weekend and had always wanted to see the Everglades so we decided to spend a Sunday exploring. It is mind boggling to think that the Everglades is only about an hour from Miami, but it is another world from the sophisticated city we just left behind. The Everglades is a place I thought I would visit within my first month at school in nearby Coral Gables, but here I am a junior at the University of Miami and I am visiting for the first time. One of the buildings was the entry point to the guided airboat tours and its educational center; the other was the Coopertown restaurant. The restaurant we were told was well known for its down-home style frog legs and gator tail. 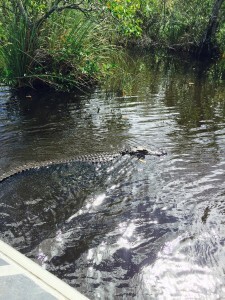 An alligator spotted while on an airboat tour (Photo by Renee Vesselinovitch). We were told to head to the back and choose a seat in the set of bleachers. In a few minutes when everyone from the boat tour had arrived a man who introduced himself as Carlos gave a presentation. He was very friendly, affable and funny. He seemed knowledgeable about the animals he brought out and also told us details about the large gators they had in captivity a few feet away. We were able to “pet” a baby alligator and boa constrictor. Afterwards, we asked Carlos about his background. He said when he was young he was a golden gloves boxing champion, but got involved with gangs and drugs. His mother, wanting him to get away from the bad influences of the city, sent him to work on a farm nearby. This farm work aroused his interests in animals, especially reptiles, and he was sure that if he had stayed where he was back in the city he would be dead because of the gangs. 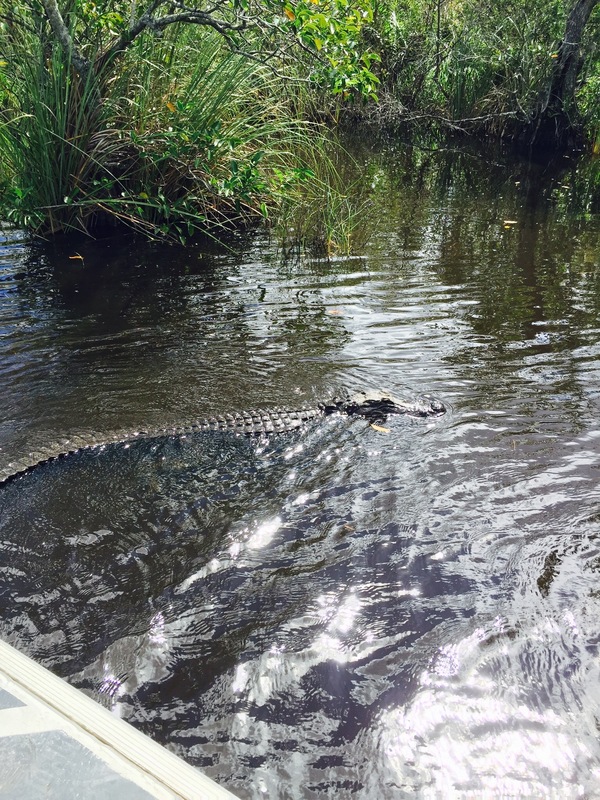 Our one-hour tour took us into the open saw grass prairies and our guide, Keith Price, pointed out many slow moving alligators drifting near our boat. He knew most of the animals by name, including a favorite alligator he calls Romeo; there was also a great blue heron he calls George. Keith’s love for the area is apparent as he describes the local plants, such as the spatterdock lily and pond apple trees. Keith was born and bred in the Everglades. 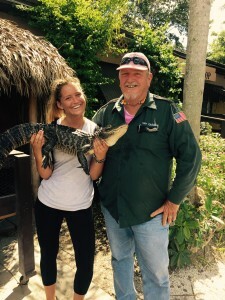 He is a senior employee and President of the Airboat Association of Florida. Keith has worked in Coopertown for 28 years. He told us that the first eight months of his life were spent under mosquito nets on airboats. His father pumped fuel for a shrimp boat company and his mother ran concessions. Writer Renee Vesselinovitch and Coopertown airboat tour guide Keith Price (Photo by Renee Vesselinovitch). Because airboats have flat-bottomed hulls with a square-cut bow, they are the best way to traverse shallow lakes or marshes. Keith also tells us that the boats are also nature-friendly. “There’s no oil in the water, no motor in the water, and you’re not tearing up the environment. Plus, whatever you hit bounces back,” Keith stated. This makes me feel good to know that we are not contributing to the endangered and fragile environment. The Everglades seem to be the focus of Florida conservationists because they are a natural habitat to so many animals and plants that are being poisoned by phosphorus pollution, dams, drains and pavement by developers; portions of the Everglades are now covered in sugarcane and the wild, open area is disappearing at sickening speeds. But these attacks don’t seem as isolated as Keith makes you believe. If you search “alligator attacks in the Everglades,” a surprising number of links appear, and most of the reported attacks seem to be unprovoked. One attack that got my attention was an unprovoked attack of an elderly man in an airboat. There were a total of 12 alligator attacks in 2013. The alligator is a beautiful and majestic creature, but like all things in the Everglades there is an undercurrent of danger and caution should be used. The Everglades reminds me of the sirens who are found in Greek mythology, most notably in Homer’s Odyssey. The Everglades are both dangerous yet beautiful, but like many wild things in nature, one should not be lured into any false feeling of well being and safety because if you drop you guard the result could be fatal. Address: 22700 SW 8th St., Miami, Fla. 33194. Directions: As you travel west from Miami on U.S. 41, Coopertown is 11 miles west of the Florida Turnpike. Bring: Bug spray, sunscreen, hat, camera and water. Hours of operation: 9 a.m.-5:50 p.m.; seven days a week. Tickets can be purchased online at: http://coopertownairboats.com/package/airboat. Adults, $23, child, $11, children under 7 years: free. A private tour starts at about $200 for three people. Consider looking for discounts. Groupon routinely offers Coopertown discounts. A group tour with Groupon is usually $17 per person.